BETHLEHEM, Pa. (December 3, 2018) - Unity Bank has launched a program to support local artists in communities where it has branches, purchasing artwork for display at its branches in Bethlehem, Pennsylvania and Phillipsburg, Emerson and Ramsey in New Jersey. "I feel it is so important to have local companies and businesses like Unity Bank who are interested in establishing programs to support the local artists in our area," said Bethlehem glass fusion artist Rebecca Shoemaker. "The local residents are able to see different types of art and the artists are able to show their work in a non-traditional setting." 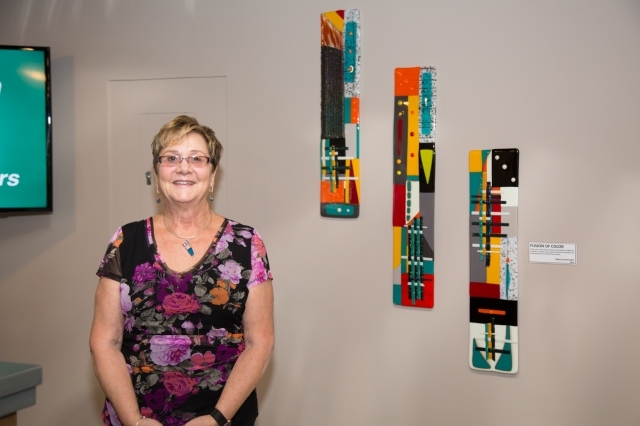 Shoemaker's work is on display at Unity's new Bethlehem branch at 2850 Easton Avenue. The branch also features a Bethlehem Steel wall mural created through an archived historical photo from the National Canal Museum. Unity provided a donation to the museum in recognition of their support. The Bethlehem branch also features photography by Nazareth's Dustin Coughlin, owner of Didco Photography as well as a Unity Bank employee. "Whenever we open a new branch or renovate an existing location, we strive to capture the community in our design" said Unity Bank President & CEO James A. Hughes. "The art program is another way for the bank to support the local community while at the same time giving our branches a look and feel that is all their own." Shoemaker's Fusion of Glass at the Bethlehem branch represents the integration of colors, shapes and textures in glass, depicting the coming together of different cultures and people. After more than 30 years in the insurance industry, Shoemaker discovered the glass fusing program at the Banana Factory in South Bethlehem and is now a glass fusing instructor, teaching all levels of students. Coughlin has been a professional photographer since graduating from Temple University with a degree in advertising and joined the bank's marketing team in 2012. The Bethlehem branch features seven of his photos from Steel Stacks, the Lehigh Valley arts and events center that was previously part of Bethlehem Steel. Four acrylic landscape and sunset paintings from Warren County, New Jersey artist Will Harmuth are displayed at Unity's Phillipsburg branch in the Greenwich Station Shopping Center at 1225 U.S. Highway 22 West. Harmuth, a Washington resident, painted two scenes of the Greenwich Township valley near the bank. He trained at the Newark School of Fine and Industrial Arts and the Art Students League before starting a career in Manhattan illustrating art works for the Invisible Man, Call of the Wild, and Kafka for the Franklin Library. Recently, he was commissioned to portray The Red Cross 9/11 comfort dog "Rusty" son of Lassie for the 9/11 Museum in Manhattan. He is an active member of the Easton, Pennsylvania art community and is currently represented by Connexions Gallery in Easton, Clinton Falls Gallery in Clinton, New Jersey and Weiler House Fine Art Gallery in Fort Worth, Texas. View his work online at www.willharmuth.com. "The arts are fundamental to our humanity and community," said Harmuth. "They ennoble and inspire us - fostering creativity, goodness, and beauty. The arts bring us joy, help us express our values, and build bridges between cultures. The arts are also a fundamental component of a healthy community - strengthening them socially, educationally, and economically - benefits that persist even in difficult social and economic times. You cannot spell community without Unity." The abstract landscape oil paintings of Teaneck artist Sol Zaretsky are on display at Unity's Ramsey branch at 475 Franklin Turnpike. Zaretsky has been an artist and teacher all his life. He attended the Music and Art High School and Cooper Union in New York City and has a B.F.A. from Yale University. He taught art at Seward High School in Manhattan, retiring in 1986. Zaretsky's work has been exhibited at the Bowery Gallery, Pleiades Gallery, Brooklyn Museum Biennial Print Shows, and the Art Center of Northern New Jersey. Last year, he received first place at the New Jersey Statewide Art Show for Seniors. The watercolor paintings of Tenn Lu are featured at Unity's 4 Emerson Plaza West branch in Bergen County. Born in Taiwan, Lu has been a resident of Tenafly and Haworth for more than 30 years. After retiring from Sony in 2006, he decided to pursue his interest in arts, drawings, and paintings. With a love of vibrant watercolors, Lu embodies impressionistic expression in his paintings. He is a frequent watercolor demonstrator and has taught at several locations and is currently teaching at the Art School at Old Church in Demarest and the Tenafly Recreation Center. He won first place at the Bergen County Art in the Park Show in 2017 and 2018.